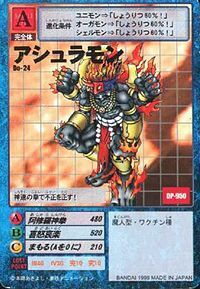 A legendary Digimon which possesses four arms and three faces, it suddenly appeared within a computer as it was analyzing ancient Hindu cultural documents. Of Asuramon's three faces, one is a face of wrath, one is a face of mercy, and the last is a face of blessings. 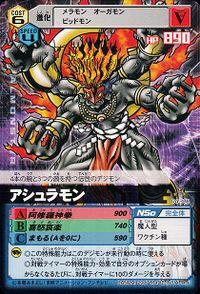 Contrary to its outer appearance, it honors justice, so it is said that if it sees injustice it will thoroughly attack it without yielding, and it can certainly be said that its personality is like an avatar of a god of light. Its Special Move "Asura Shinken" is a Punch Rush unleashed from its four arms, which possesses the offensive power to completely annihilate the opponent itself. Naturally, when that is used while Asuramon has its face of wrath, it is its last and strongest technique. 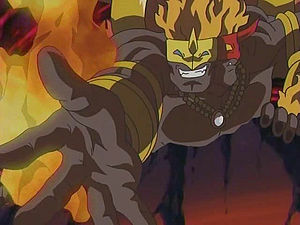 — Digimon Frontier: "Tomoki's Lonely Battle, Asuramon's Trap"
In Hindu mythology, the Asura (Sanskrit: असुर) are a group of power-seeking deities, sometimes referred to as demons. They were opposed to the devas. 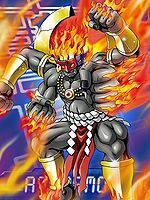 Anime/Manga Digimon Frontier: "Tomoki's Lonely Battle, Asuramon's Trap"
Asura Shinken  Asura God Fist 阿修羅神拳 N/A Fire Fist of Shiva/Fist of Asura Attacks the foe with flaming punches or fireballs from its four fists. 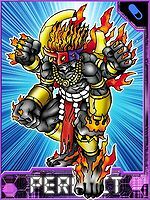 Asura Ennetsuken  Asura Sweltering Fist 阿修羅炎熱拳 N/A Fire Fist of Shiva Uses punches to unleash bursts of heat that explode on impact. 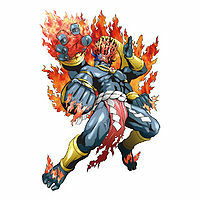 Asura Bakunenken  Asura Exploding Fist 阿修羅爆燃拳 N/A Fire Fists of Shiva Shoots a blast of fire from all four fists at once. 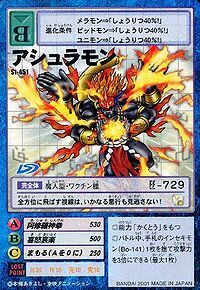 Kidoairaku  Joy, Anger, Sorrow, and Humor 喜怒哀楽 N/A Multiple Faces Generates an arc of fire from its hands to trap the enemy, or uses its emotions to fire rainbow-colored shock waves at the enemy. 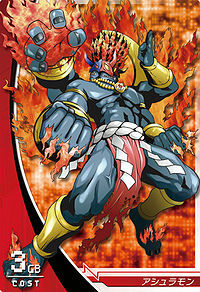 Asuramon appeared inside Sephirothmon and battled Himi Tomoki. Blizzarmon deleted him and moved on. Asuramon is available as a Digimon Medal. 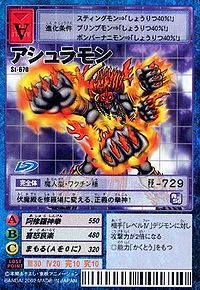 Obtainable by Jogressing Greymon, Leomon, Garurumon or Igamon with a compatible Digimon. 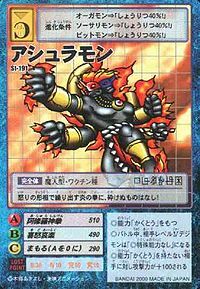 Can evolve to War Greymon. In its face of wrath, nothing can stand up to its fists of fire! Capable of seeing in all directions, it won't let anyone get away with an act of evil! This fist-god of justice turns pandemonium into a bloodbath! It reforms injustice with its fist of god speed! This Sindhese demon god packs anger, sorrow, and blessings into its fists! A Digimon from ancient Hindu legend, it possesses four arms and three faces each representing wrath, mercy, and blessing. 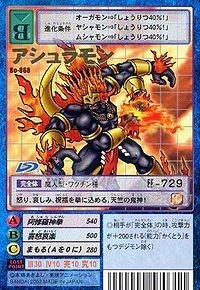 It is also said to be an avatar of the light deity, valuing justice highly and exacting its wrath upon injustice. 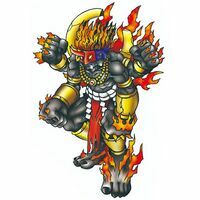 ↑ 6.0 6.1 Digimon Frontier: "Tomoki's Lonely Battle, Asuramon's Trap"
This page was last modified on 23 April 2019, at 00:57.